Double Diamond Stretch Furniture Cover from Collections Etc. 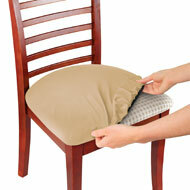 Give any room a whole new look in minutes for a fraction of the cost of re-upholstery. 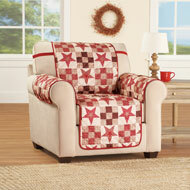 The subtle textured double diamond pattern allows you to make old sofas, loveseats or recliners look like new again. Machine wash. Polyester and spandex. Colors available in Burgundy, Chocolate or Beige. Different sizes available to fit a Recliner (fits up to 82"circ. 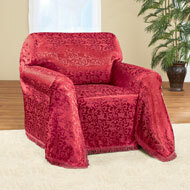 ), Jumbo Recliner (fits up to 92"circ. 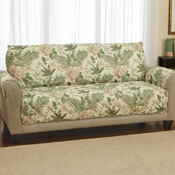 ), Loveseat (fits up to 70"W) or a Sofa (fits up to 92"W) Wingchair (fits up to 42" back height). Recliner and Jumber Recliner come int 4 pieces. Sofa and Loveseat are one piece. Makes the sofa look new again. I can't believe it fit. Soft and nice fit ! Double Diamont Stretch Sofa cover. I had a small Lazy Boy Recliner in great condition, just didn't like the color. All the recliner covers I researched were for the larger recliners and too big for my needs. I was so excited when I found this cover, but a little leery about how it would look. It looks great. Fits perfectly, was very easy to cover the chair. I especially love the embossed print, gives it a soft look. I don't know how it will launder because I just got it, but it seems to be made well. - bobbier, Riverside, Ca. I would by this item again. Roomy and easy to slip on furniture. didn't fit the recliner. Wish the description would have been more complete. If it would have been I would not have ordered this product. - Madgeye, Ga.